Due to many structure changes in prior versions of Staffinder we are only providing the upgrade utility to upgrade from 2.x and newer. If you are still running a version prior to 2.x you will need to contact our tech support for help to upgrade to the latest version. We will be happy to convert your existing data once you have upgraded. below you will find the upgrade instructions on how to get your system running in the shortest amount of time. The installation for both the Enterprise and Standard Editions are described below. 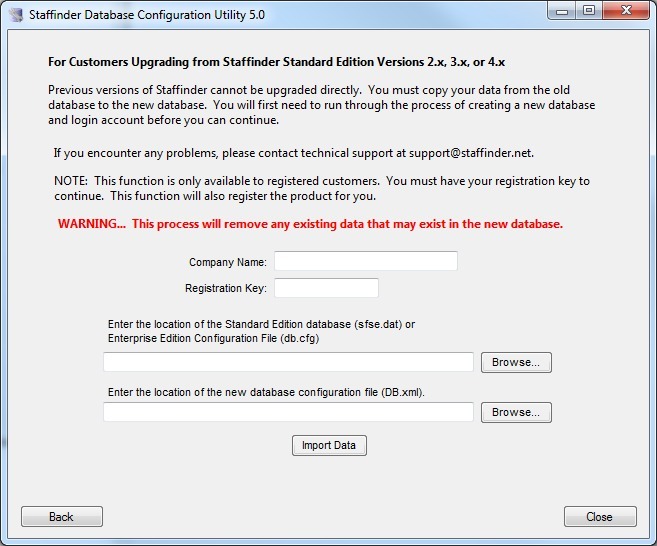 If you have not installed the client portion of Staffinder you will need to refer to the installation instructions prior to importing your data. Note: Your license key is required so you must purchase the upgrade before you can import your data. Run the Database Configuration Utility from the start menu and select the "Upgrade from Standard or Enterprise Edition" button. This icon will only exist if you installed the client and selected "Administrator" during the installation. If you did not do this you can browse for the file and double-click the "dbconfig.exe" file in the location where you installed the server files. You will need to provide the location of your existing database. If your upgrading from the standard edition you will need to locate the sfse.dat file in your server directory. If your running the enterprise edition you will need to locate the database configuration file db.cfg. Staffinder 2.x users will need to locate the sf2k.dat file. Click the Import Data button when you are ready to go. After the database is imported, you can now visit your workstations to install the new Staffinder client. After the client is installed on the machines, they should be able to log into Staffinder and see the data copied from the old database. Remember, only information such as departments, employees, In/Out board settings and such will appear in the new database. Employee status will be blank until they start using the program. Depending on which version your upgrading from you may also import history and security settings and other newer features that may not exist in earlier versions.